SIOUX FALLS, S.D. – If you’re still keeping up with your New Year’s resolutions, you may be in the second week of a new diet. While there are a number of diets on the market, experts say one of them is coming out on top. Growing up Greek, Eve Fisher says the Mediterranean diet is a meal plan she’s followed her whole life. Her husband Allan is also a fan. “It’s easy to prepare, and of course I have an excellent cook here that knows how to cook it,” Allan Fisher said. The couple says the diet is full of flavor while maintaining nutrition. According to Eve, it’s all thanks to herbs. “One thing that American cooks by in large do, they put on like that much herbs, and you want you know, a palm of your hand, throw it in the dish and it just zings it to life,” Eve said. Registered dietitian Tiffany Krogstad says the diet is primarily plant based, with an emphasis on cooking with olive oil. “It includes fruits, vegetables, whole grains, nuts and seeds, cooking with olive oil, including lean proteins, more focused in on things like salmon and tuna, getting those omega 3’s in there,” Krogstad said. The diet also suggests physical activity, but Krogstad says that’s not the only area it differs from other diets. “It incorporates wine, limiting for women having no more than one glass a day for women and then 2 glasses a day for men,” Krogstad said. She says it’s easy to follow and not overly restricting, which is why many find success. “Everything can fit into this diet. Really it focuses on limiting things with added sugar and refined grains,” Krogstad said. In addition to helping people lose weight the diet plan also offers people multiple health benefits. Krogstad says omega 3’s reduce inflammation in the body, helping patients with a history of heart disease and diabetes. “I really stress this diet to prevention of re-occurrence of cancer,” Krogstad said. Krogstad suggests using the plate method to give patients an easy guide to follow. 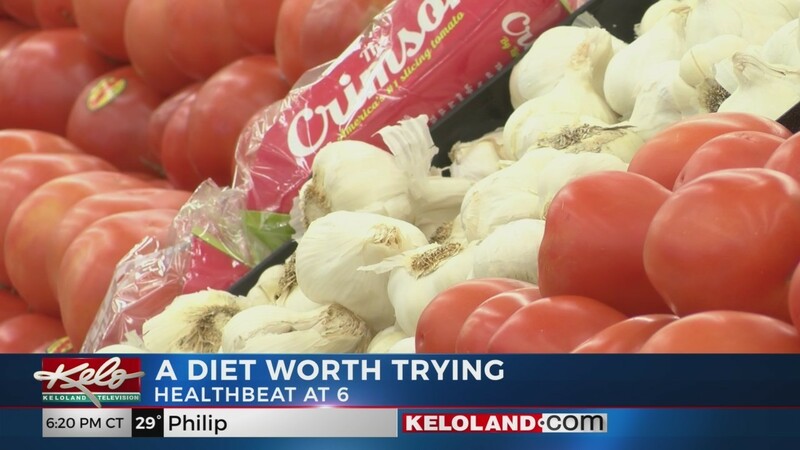 “To be honest, we should all probably be following more of a Mediterranean style diet,” Krogstad said. “It’s just so tasty, it’s healthy, you know it’s good for you,” Allan said. Krogstad added the Mediterranean diet was rated as the best diet for diabetes and heart disease, easiest to follow, and the overall top diet for 2018.